Sonata Arctica will, according to me, never put out records on par with the early stuff again, because the bigger progressive steps they haven taken, the more they have lost the ability to create great power metal melodies, which unquestionably was a big part of the reason to why the Finns in the first place rose to some fame around the time of the millennium change. This record, the band's ninth, is definitely not their most progressive work to date though. It opens up really well indeed, with the songs Closer To An Animal and Life, before slowly going into a kind of dormant state in a way, because from there on I can't seem to find those songs where I really can feel the groove building in my whole body. It's not bad at all, but I miss a necessary attitude and killer instinct in order to push the songs from a point of decent or good up to fantastic or awesome. The great stuff that I find from song 3 and on, where they've been able to put together the ingredients in the very right way, for the most part only lasts for shorter moments and it's like I'm often waiting and waiting for things to explode, but it's like every time the band gets near detonation things suddenly, and sadly, go back to a less rocking environment. The riffing is mostly too kind unfortunately and when there is an opening to spit out the flames, the guitar playing doesn't get full room to dominate. Even if the band has left the younger days behind and also the true original idea most of the time, the undisputed main man, songwriter and vocalist Tony Kakko doesn't want to completely leave his musical roots, as some faster songs are present and especially Rise A Night is a salute to older times. I find the album quite comprehensive and a few of the 4-5 ballads or semi-ballads have a similarity to past efforts as well. At this point, this far into the band's career, I recognize quite a few of the arrangements and melodies throughout the record. I don't believe that they have ran out of inspiration, but even if it's probably unintentional, the band is a little bit copying what they've put out before and a second part of White Pearl, Black Oceans really provides fuel to the fire in that department. I would never call The Ninth Hour anything less than a satisfactory effort, but as we all know, satisfactory isn't really what we're looking for in terms of record releases. 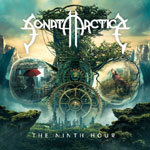 Sonata Arctica pretty much gives people what they can expect and if you're still a fan of the band to this very day, I guess that you will find some valid stuff to fill your need in the end.